If you have knowledge (or corrections) you'd like to share, please contact us! In the late 1800s, our neighborhood was mostly comprised of large estates. About half of the SABA area, the part east of Georges Lane, was formerly the estate of the Humphreys family (for which Humphreys Road is named). The Humphreys house still stands on Haverford Road, across from the Ardmore Junction stop. It is marked with an historic plaque, honoring Joshua Humphreys the naval officer who designed the U.S.S. Constitution ("Old Ironsides"). In the late 1800s, the Humphreys property was owned by General A.A. Humphreys, Joshua Humphreys' grandson. Here is an unflattering biographical sketch of General Humphreys. In 1883, Saint Mary's Episcopal Church was founded and, in 1887, moved into their home on Ardmore Avenue. In 1895, Saint Mary's opened the St. Mary's Laundry, on what is now Aubrey Avenue. The church did so by purchasing the Merion Cricket Grounds, after a fire damaged the Cricket Grounds clubhouse. Apparently, part of this plan was the first sub-division in South Ardmore, on the former Cricket Grounds, including Cricket and Aubrey Avenues, with the intention of providing homes for the employees of the laundry. 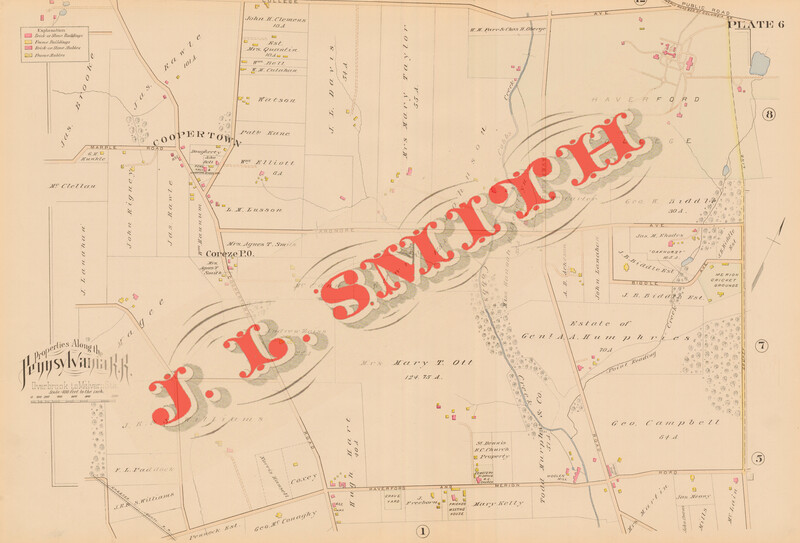 The Lower Merion Historical Society has a collection of Map Atlases, beginning in 1871, and going through 1948. Many include beautiful, detailed maps of our area. By perusing these maps, you can learn much about the evolution of the neighborhood. For example, in the 1900 map you can clearly see a pond on what is now Normandy Park. This was part of the evidence SABA presented, in the early 2000s, to persuade Haverford Township that Normandy Park was a watershed. Having established it was unsuitable for development, the Township used eminent domain to prevent the construction of 16 town homes on the property. You can also see on the map the stables that were converted into what is now Normandy House. Here is a listing of the maps. They are the pages from the Main Line Atlases Collection that show our area. (You can purchase quality reproductions from Franklin Maps.) Enjoy!